A swarm of five earthquakes struck near Twizel earlier this afternoon. A swarm of five earthquakes struck near Twizel between 1:10 and 1:39 p.m. today. Activity began with the largest member of the swarm, a magnitude 4.6 earthquake centred 10 km south-west of Twizel (50 km south-west of Lake Tekapo, 100 km west of Timaru) at 1:10 p.m. This was also the deepest of the quakes detailed by GeoNet, but was only 9 km deep. 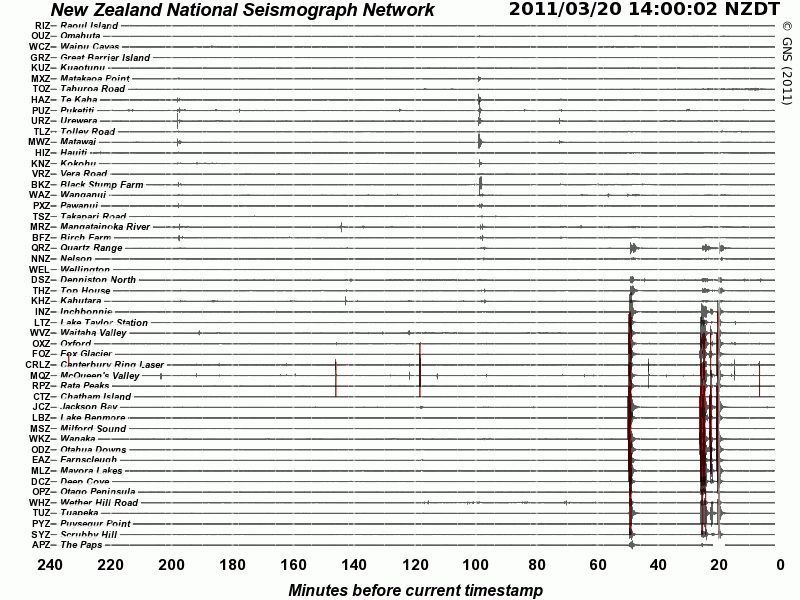 The quake was felt strongly by some at Twizel and as far north as Nelson and Marlborough. [click to enlarge image] GeoNet’s national seismograph network clearly showed the traces of the quakes. Twenty-three minutes later at 1:33 p.m., a shallower magnitude 4.3 earthquake struck 20 km south-west of Twizel (60 km south-west of Lake Tekapo, 110 km west of Timaru) at a depth of 5 km. This event was felt at Twizel, Omarama and Lake Tekapo. A minute later another magnitude 4.3 quake, also a a depth of 5 km, struck 10 km south-west of Twizel. This earthquake was felt from Omarama to Lake Tekapo, and also on the coast at Timaru. [click to enlarge image] GeoNet’s seismograph at Wanaka shows the traces of the five earthquakes that struck nearby today. Another two earthquakes struck the same area at 1:36 p.m. and 1:39 p.m. The traces showing on the Wanaka, Rata Peaks and Otahua Downs seismographs indicate that all five were situated very close together. However, GeoNet has not yet analysed the last two events. Their traces suggest that the fourth quake was slightly smaller, and the fifth quake was similar in size to the magnitude 4.3 events. 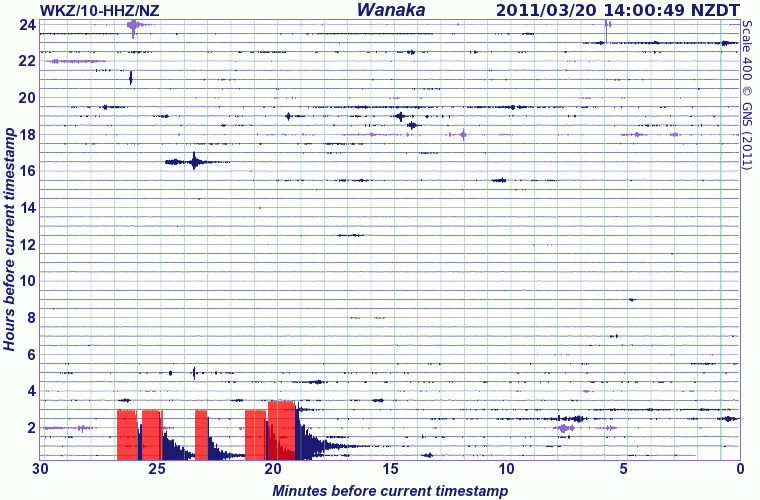 A swarm of magnitude 3 and 4 earthquakes struck near Twizel between March and May of 2009. This entry was posted on Sunday, March 20th, 2011 at 5:34 pm and is filed under Earthquakes - Observations. You can follow any responses to this entry through the RSS 2.0 feed. You can skip to the end and leave a response. Pinging is currently not allowed.